SAN FRANCISCO and ST. JOHNâ€™S, Sep 24 (IPS) - Caribbean leaders want larger countries to pick up the pace at which they are working to meet the climate change challenge and keep global warming from devastating whole countries, including the most vulnerable ones like those in the Caribbean. Diann Black-Layne, ambassador for Climate Change in Antigua and Barbuda's ministry of agriculture, lands, housing and the environment, said that at present, most studies show that globally we are on track for a 3-degree Celsius temperature rise before the end of this century. "Currently, we need to be below 2 degrees Celsius, preferably at 1.5 degrees, to see a drastic improvement in climate," Black-Layne told IPS. "To put this in context, globally we are already 1 degree Celsius warmer than pre-industrial levels." "More importantly, a global agreement requires everyone to do their part, to build trust and encourage others to act," Black-Layne said. "SIDS can be some of the early movers to decarbonise our economies – that means growing an economy without growing emissions." "Dominica was hit by Irma and Maria, in fact devastated to the tune of 275 percent of its GDP last year. And that came on top of Erica which devastated communities and led to loss of life," said Mottley, whose Barbados Labour Party won all 30 seats in the May 24 election. "This is our lived reality in the Caribbean. This is not an academic discussion. This is difficult for us. And therefore, when the discussions took place between whether it is 1.5 or 2 , others could wallow in the ease of an academic discussion. For us it will have implications for what communities can survive in the Caribbean, in the Pacific and different other parts of the world." In 2015, 196 Parties came together under the Paris Agreement to transform their development trajectories so that they set the world on a course towards sustainable development, aiming at limiting warming to 1.5 to 2° C above pre-industrial levels. Through the Paris Agreement, parties also agreed to a long-term goal for adaptation – to increase the ability to adapt to the adverse impacts of climate change and foster climate resilience and low greenhouse gas emissions development, in a manner that does not threaten food production. Additionally, they agreed to work towards making finance flows consistent with a pathway towards low greenhouse gas emissions and climate-resilient development. "That simple example showed us how the change of behaviour of citizens can make a fundamental difference in the output. We aim by 2030 to be a fossil fuel-free environment but we can't do it just so," she said. "It means that our options for development and financing are seriously constrained but our reality to fight what is perhaps the gravest challenge of our time continues. We cannot borrow from the World Bank or other major entities because we're told that our per capita income is too high," Mottley said. 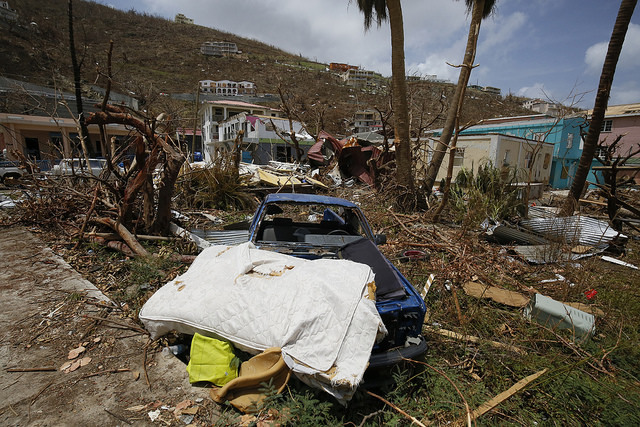 "But within 48 hours, like Dominica, we could lose 200 percent of our GDP. That is the very definition of vulnerability if ever there was one. And unless we change it we are going to see the obliteration or civilisations or we're going to see problems morph into security and migration issues that the world does not want to deal with."